Deep Field, a musical piece inspired by a Hubble observation. The original Hubble Deep Field. Planets orbit their stars. Stars are born and die and seed the Universe with more gas and elements to create more stars. Galaxies spin. Closer to home, we see the Sun rising and setting, we awake and we sleep. Even the sounds we hear are cycles; musical chords are juxtaposed oscillations at specific frequencies, compression and rarefaction of air. And here we are, at the beginning of a new, if somewhat arbitrary, cycle. With a fresh orbit around the Sun lying ahead of us, I want to show you something to think about in the coming year. The image at the top of this article is called the Hubble Deep Field. It was the first of several subsequent projects using the venerable observatory to stare at a single patch of sky for days, weeks, building up an image of some the faintest objects ever seen. When it was first undertaken, we weren’t sure what we were going to find. When the observations were processed and assembled, what we found was awe. Nearly every object in that image is a galaxy, a vast, sprawling complex of gas, dust, and stars. Thousands were revealed in the image, despite the field of view being so tiny. If you held a grain of sand on your finger, your arm outstretched, it would occupy as much of the sky as the Deep Field does. And yet, what lies inside those boundaries is the Universe itself. Another version by the Bel Canto Choir Vilnius is available, too. The piece mirrors the observation in many ways, metaphorically and literally. It seems to be made of several themes, somewhat disjointed, that come together to form a greater whole, rising to a stirring climax. But note the image itself! In it, we see that the most distant galaxies—the ones we see when the Universe was young—are smaller, less well defined. We know that these galaxy fragments in the early Universe came together under their mutual gravity, merging to form the glorious, far larger and more well-organized galaxies in the modern Universe. 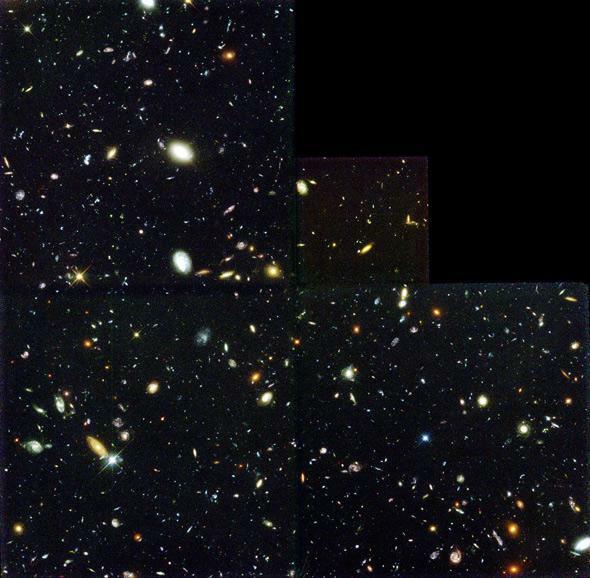 A section of the later Hubble Extreme Deep Field, released in 2012, shows glaxy fragments billions of light-years away. Some of the music sections are dissonant, with conflicting chords, resolving themselves after a moment, or repeated with slightly different component notes to resolve them. I rather like that; it reminds me of seeing apparently overlapping galaxies in the image that become clear when zoomed in, or simply become easier to distinguish. And part of the point of the Hubble observation was to use its superior eyesight—what astronomers actually call resolution!—to distinguish all the objects in the field. Two different meanings for the word, yet both come together where music and science meet. Toward the end, the choral part starts, wordless voices in gorgeous, lush harmony with the orchestra. The tone of the whole work changes, but in a very organic, natural way, uplifting and hopeful yet retaining its pensive, even reverent attitude. It reminds me of the ending of Holst’s suite “The Planets,” where voices fade out at the end of “Neptune”, as if we are being borne away from the solar system, the Sun and its attendant planets receding and fading as we move away into the black. The idea of using the audience phones is clever. Besides adding to the sound of the music, from the orchestra’s view they see dozens, hundreds of small lights scattered around them out in the black hall, mimicking the galaxies in the Deep Field itself. What a lovely idea. I have listened to this piece of music many times now, and I must muse on its origin. These galaxies, these distant structures that dwarf us and crush our sense of space and time … they do not care about us. They are things, not alive, not sentient, incapable of feeling or purpose. And yet they are us. 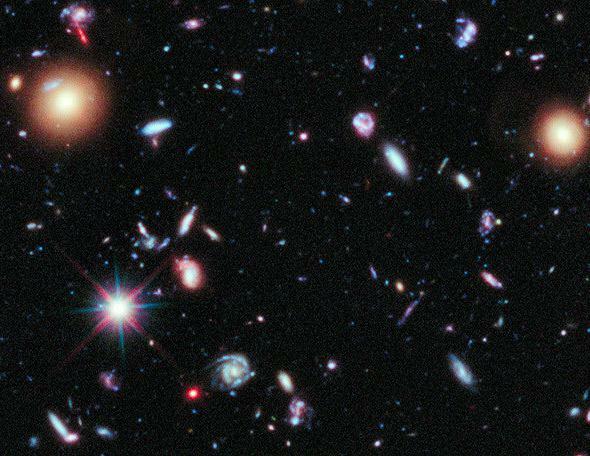 The galactic fragments and even full-fledged galaxies in the Hubble Deep Field are representative of the same cosmic constructs that formed the Milky Way, the first and second generation of stars in it, the supernovae and heavy elements that settled into swirling disks of material that birthed our Sun, our planet. 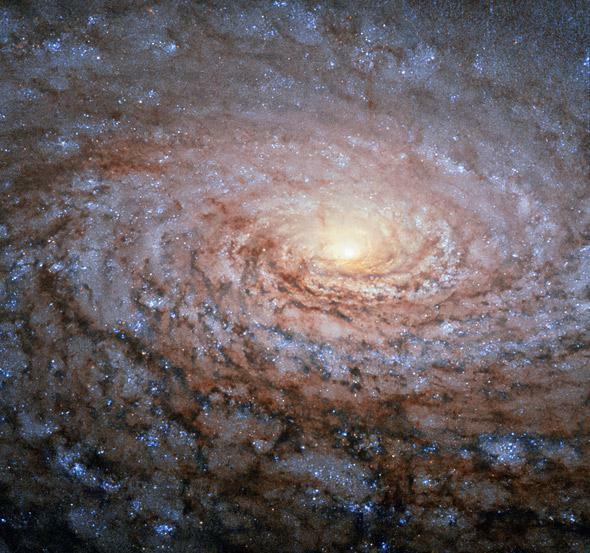 M63, a nearby spiral galaxy and an example of unmitigated gorgeousity in our Universe. We evolved here, on this spinning planet, we grew from abiotic material to life, became complex, and eventually, after billions of years, became us. You. Me. Our sense of beauty and wonder and curiosity turned our gaze to the sky and allowed us to discover the pieces of Universe that were our origins, looking back across countless light years to how we came to be. This in turn inspires art, prose and music, a unique outlook and perspective on nature that we can share and appreciate. The science created the art, and the art informs the science. Perhaps one could exist without the other. Perhaps. But together they are more than either individually or summed. Together they are the very basis of what it means to be human, the joy of understanding and expressing that humanity. Happy new year. There will always be new years, but never quite this one again. Do what you can to make it a good one. My thanks to astronomer, astronomy communicator, and friend Kim Kowal Arcand for the link to this wonderful piece of music.